Hey guys! I forget to take picture when I was doing these nails, so there’s no tutorial. But it’s not that hard to create so I’ll try to explain it. Just paint your nails in a color you like, I used orange. I applied 3 stripes of white to create the front. 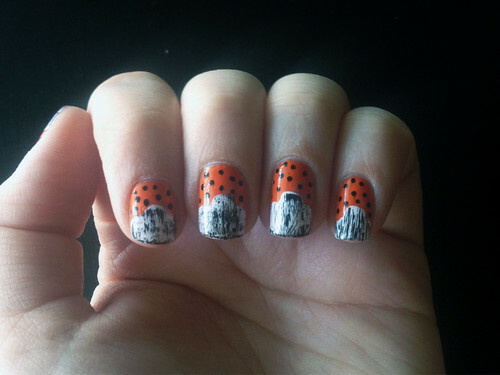 You can use a nail art tool or a toothpick to create the random dots. The black stripes on the white are the same technique I used in my previous post ‘Painted canvas’. Last but not least apply a top coat to seal everything! I love these nails, you are so good at doing them! Thanks or liking my DIY blog post, it means so much to me! Since you love nails so much, have you ever tried to make your own polish color? I sure loved my homemade nail polish! Those nails are adorbs! I wish I had the talent to do that!